In the past, gamers and overclockers had to choose between cooling performance and noise level. However, as the design of cases, coolers, and fans become more advanced as well as improvements in the breatheability of sound dampening materials, builders can now choose the optimum balance between silence and efficient cooling without sacrificing too much on either end. Today, we’ll be focused on putting together a balanced mid range gaming PC that will play even the most graphically intensive games on the market today (Battlefield 3, Skyrim, Crysis 2) at high to ultra settings with a resolution of 1920×1200. Additionally, we’re also focusing on noise performance in this build as well. For gaming, you’ll be hard-pressed to find a difference between the i5-2500K and the i7-2600K because most games today can only take advantage of four threads or less. The fully unlocked quad core i5 2500K processor is very powerful, yet sips power and outputs little heat. This means that it requires fewer fans and smaller heatsinks to keep it cool. For those who invest in that larger, more powerful CPU cooler though, this CPU will be able to handle some intense overclocking with just a few tweaks on the multipliers and voltage, easily yielding a 20%-30% boost in performance. This set of low profile DDR3 memory only runs at 1.35V which translates to less heat output, and is definitely very important in a silent system that might not have the best cooling out there. The low profile design also allows for larger coolers to be installed in to the system, such as the Noctua NH-D14 as well as the monstrous Phanteks PH-TC14PE. Remember how ASRock wasn’t really even on the map for enthusiast PC builders a couple years ago? Well, they’re back, and with a vengeance too. The ASRock P67 Extreme 4 Gen 3 is one of the most competitive P67 motherboards on the market featuring support for PCIe 3.0, USB 3.0, SATA 3 6Gb/s, Crossfire/SLI support and much more. Additionally, for the overclocker in all os us, the board also features an advanced V8+2 phase power design along with high end premium 100% Japanese made gold capacitors, which will ensure that the board will last for years to come. I was initially considering the Fractal Define R3 and NZXT H2, but then I remembered the newly released Corsair Obsidian 550D. 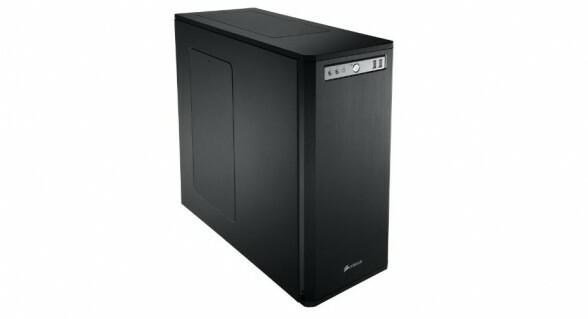 Unlike the Graphite 600T and Obsidian 650D, the Obsidian 550D approaches case design with silence in mind. Corsair has put some real effort into this case, packing it with many great features such as angled ventilation holes, vent covers, high quality sound insulation, Corsair’s tool free system, and a neat aluminum front door that can be opened from either side. Just because it’s a silent-minded case doesn’t mean it’s missing out on cooling performance as well. It has plenty of fan mounts – 10x 120mm, which means you’ll have plenty of headroom for future cooling upgrades. With the upgrade to 28nm, AMD’s new Radeon HD7850 is going to be one of the coolest, quietest and most power efficient mid range graphics cards on the market. As such, this brand new custom cooled HD7850 from MSI will fit perfectly into the theme of this build. For those unfamiliar with MSI’s awesome Twin Frozr III cooler, the cooler is advertised to run 13.7 dB quieter and keeps the GPU 10℃ coolers than the reference design (which is already very cool). Yes, $300 is quite a steep price tag for an SSD. However to justify my choice, the performance and reliability of this SSD are both equally stellar. Given the fact that this SSD has a maximum capacity of 256GB, you will have plenty of space for storing games and software. Additionally, I chose a larger capacity because I didn’t want to have a loud and annoying mechanical storage drive ruining the whole purpose of the “silent” system. I recommend this power supply for its amazing reliability and price to performance. Additionally, Corsair’s long warranties and the excellent customer support is more of a cherry on top. For a more silent and power efficient experience, consider investing into the slightly more expensive Corsair AX650 power supply. This fully modular power supply will include an industry leading 7 year warranty, 80 plus gold efficiency, as well as a double ball bearing fan. This large tower cooler seems a little menacing for a silent PC; nevertheless it provides fantastic cooling with minimal sound. The fans included here are also high performance silent fans that Noctua is famous for manufacturing, which will fit perfectly into this build. Noctua fans are known as the Cadillac of fans for two main reasons. First of all it costs up to $20 for a fan, secondly it performs incredibly well while staying incredibly silent as well. If you’re willing to pay the premium for silence, Noctua fans should definitely be on your shopping list. In total this build will be around $1,440.05 including shipping and tax on Amazon. Of course, case fans are not included in this price as it’s optional for a reason. If Windows 7 is unnecessary, the build can be had for $1,340.06. Finally, remember that if you have any questions, need some help, or need to fit the build into your budget feel free to visit the forums at http://forums.custompcreview.com. Myself, or the community here will be more than happy to help you out with your own custom build or answer any computer questions you may have. If this build doesn’t fit your needs, feel free to drop by our Computer Builds section to find more computer builds. Tech Enthusiast, Devoted Gamer, Senior Editor. if I want a graphics card for more and do crossfire? that power supply will I need? Yup. Should be fine. What graphics cards are you going to be running in crossfire? If it’s just 2x 7850’s, you’ll be fine with a TX650. does this build perform better than the march build? It should perform similarly. However, this build is aimed at those who want peace and quiet. I am in the middle of this build. Impressive, alex.cpcr! One question: I went for two GPUs and Crossfire mode. Power runs to each graphics card. Do I also need to run power to the Xfire connector on the motherboard? Thanks mucho! You suggest to had Noctua case fan. Is this to replace the fan already in the Corsair case or to add more fan ? Looks like the recommened MoBo might on the verge of being phased out? (Amazon promising delivery in “1 to 2 MONTHS”?!) Do you have an alternative recommendation to go with the i5 CPU? Yes, since this build is a couple months old, the motherboard is being phased out. At this point I recommend both a different CPU and motherboard, the i5 3570K over the i5 2500K and the Gigabyte Z77X UD3H. Feel free to drop by the community forums and post your build if you’d like me to take a look at what you’ve got.